The position you assume as you enter the corner is critical to your path and velocity through it. For a left hand bend, the best position to take as you head towards it is as far over to the right of the lane as possible. This gives you maximum view and line of sight through the corner. The reverse is true of a right hand bend. In a perfect world (on the track for example) you can assume the extreme outside edge as the corner starts, head to the inside at the apex and exit towards the outside again. This is called O-I-O (or outside-inside-outside) and is taught everywhere, from the MSP to the race track. This is the optimal “straightline” through the corner and is absolutely the correct line to take if you have a clear view through the entire corner on entry and conditions permit it (which is rare). You may notice I said above “in a perfect world” and this is the real kicker. Street / canyon riding is almost NEVER perfect. Gravel, rocks or potholes may lie ahead. Perhaps a car pulling out of a side street? Oncoming traffic? Roadworks? All manner of potential hazards can exist all the way through a corner and you must often adjust your entry position, speed, line, throttle control and exit point to compensate for a myriad of potential hazards. This may mean a corner you could easily take at 80mph in a perfect world scenario actually has to be taken at 50mph in a real-world scenario. For street riding, the line you take through a corner should always be a compromise between the greatest radius you can take and the best view through it. Your line is always secondary to safety. As a general rule of thumb, always hold the optimal outside line around a corner until you can see your exit. I addressed this in another article on the site so won’t repeat it all here, but the way you steer a motorcycle is via counter-steering. If approaching a right-hand bend, assume the optimal position (to the left of your lane) and then push up gently on the right-hand side of the bar as you enter the corner. This will initiate lean and steer the motorcycle to the right. If more steering is needed, simply push a bit more on the bar. Ensure your entry speed is appropriate for the corner you are about to enter. Simply rolling off the throttle as you approach will scrub off a good amount of speed. Use engine braking (change down) to facilitate further speed reduction by the time you hit the corner entry point. You shouldn’t need to brake unless you are traveling fast and approaching a very tight corner and can’t slow down enough with engine braking alone. Staying off the brakes and relying on rolling on and off the throttle will result in a smoother, more hooked up, confident ride. Ensure you are in the correct gear. Too low will cause the rear wheels to lock and the engine to rev really high. Too high and the engine will labour and could possibly stall. By assuming a good position on the outside of the corner, this will give you maximum visibility through and around the turn so you have a good idea how sharp the bend is before you get there and can adjust your speed accordingly. 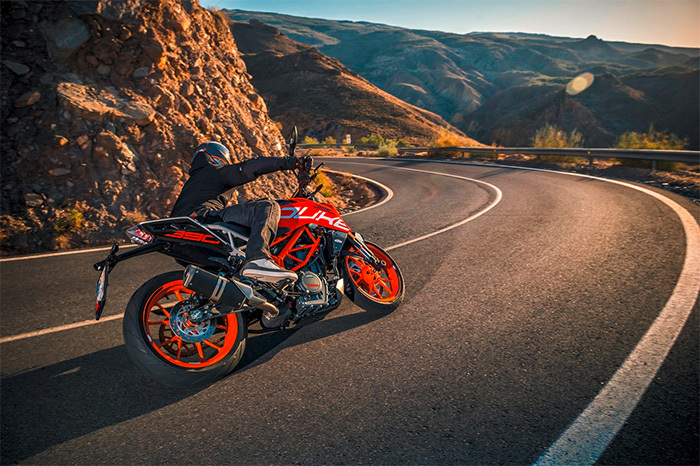 Once you start to lean the bike over, hold a steady throttle until you hit the apex, and then gently roll on the throttle and power your way out. Always be smooth with the throttle. Don’t stab at it. It’s destabilizing and dangerous, especially when cornering. Always complete your lean *before* rolling on the throttle. You should never apply throttle while you are still in the process of leaning the bike over. Hopefully the above tips give some food for thought, but as mentioned at the start, translating the written word into practical skills isn’t easy. We spend a good amount of time on all the above on our advanced rider courses, where not only will you be putting the above theory into practice, but will receive constant, immediate feedback via radio from your instructor who is closely following behind. Contact us for more information.